I came back from vacation in Florida last month and didn't have much fresh food in the kitchen but luckily my cupboard provided me with enough ingredients for this recipe. Also, Kristen at Fab Fit Chicago inspired me with her curry recipe! South Asians are all about their spices and curry generally contains spices, like turmeric, cumin, fenugreek, and ginger, which have great health benefits. This dish can be eaten on its own for lunch or dinner but also makes a great side dish! Add vegetable broth (or water and vegetable bouillon) to large pan and bring to a boil. Peel and chop the sweet potato into small cubes. Add quinoa and potato to pan, reduce to a simmer once the water is boiling. 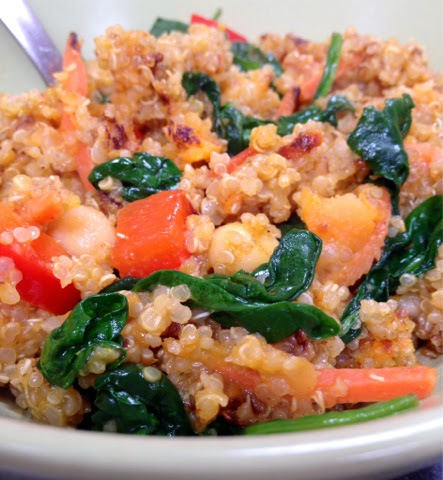 Let simmer for about 15 minutes or until the quinoa is cooked and water mostly absorbed. Then, add the red pepper, chickpeas, peas, oil, and curry powder and sauté for a few minutes, add more water/broth if necessary. Add spinach leaves and cook until wilted. Add salt and pepper and hot sauce to taste. You can add more curry also to adjust taste. Ready to serve and great as leftovers too! What is your favorite curry recipe? What is your go-to meal when you get back from travel? Yum! Love that you can make so many different variations on this recipe! I know right! Really, any veggies will work in this recipe.